I came across this interesting listing today which showcased a really beautiful bit of architecture out in Nanoose Bay. This area is a beautiful bit of Vancouver Island situated in between Nanaimo and Parksville. There are many gorgeous homes here but today we look at one designed by architect Michael McNamara. Thanks to vaulted ceilings the stonework you see here reaches high up over two levels, blending in masterfully with the woodwork. There’s a hint of medieval in the archway leading you up two the spacious second floor. This must have taken so many hours to complete with little room for error. 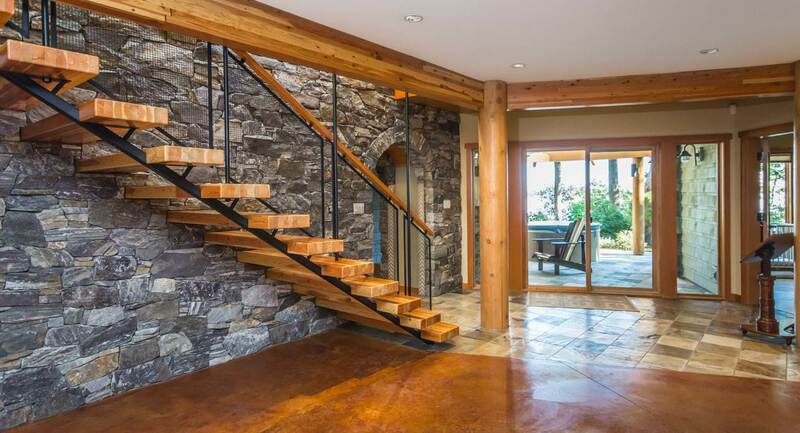 The blending of the timber frame and natural stone fit perfect out here on the west coast. 2463 Ainsley Place in Nanoose Bay is quote the house and it’s listed right now for $3,998,000 CAD with Karen Kenyon. Definitely check out the entire home and if you’re interested you can reach her directly at 250-741-7517 to learn more.